Pizza Brothers of Norwalk is a locally owned and operated pizza establishment that has been in Norwalk for more than 30 years. 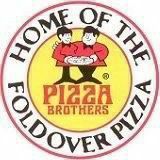 We had a Pizza Brothers in Findlay back in the '80s, and my family loved the roast beef foldover and the taco foldover. The drive here was over 1 1/2 hours, but well worth it! Amazing food and wonderful service! A look behind it all!